MiDarkTheme is a dark theme (obviously) that contains 36 icons, a dock, status bar, lockscreen background, wallpaper, SMS mod, Safari mod, Phone mod, pop-up mod, Calculator mod, badges, page dots… etc. 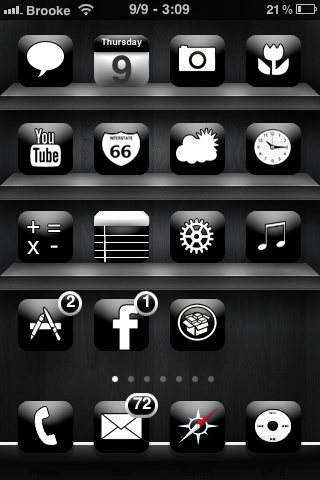 Overall it is a decently designed theme. There are a few things that could be a little cleaner… like the Safari loading mod but overall it’s not too bad. You can get MiDarkTheme via the modmyi source.